European tour player David Green hits a chip shot. When you miss the green, you can find yourself in many different situations. In most cases you will hit a standard chip shot, but other times you may have to chip it with more or less roll. If you know the proper technique, you can play any chip shot around the green with confidence. The standard chip shot is the most-played chip shot around the green, played with any wedge or your 9-iron. You can hit this shot out of the rough or fairway. A standard chip shot flies one-third of the way to the hole and rolls the rest of the way. Play the ball in the middle of your stance with your hands pressed forward. Make a short backswing and keep the club face square. A soft chip shot flies just short of the hole and rolls a few feet. You play this shot with a lob or sand wedge when you have to hit a short shot over a bunker or mound. Set up with an open club face at address and the ball slightly forward in your stance. Make a short backswing, keeping the club face open, and accelerate through impact. 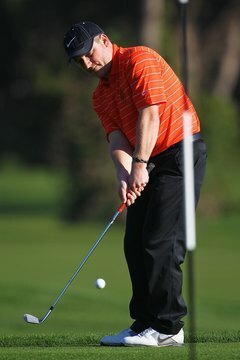 The ball should land soft with very little roll. A low chip shot is played from the fairway or short rough, when you can roll the ball all the way to the hole. Play the low chip shot with a 6-, 7- or 8-iron. Position the ball in the back of your stance, press your hands forward at address and keep the club face square as you swing back. This produces a lower shot with a lot of roll.